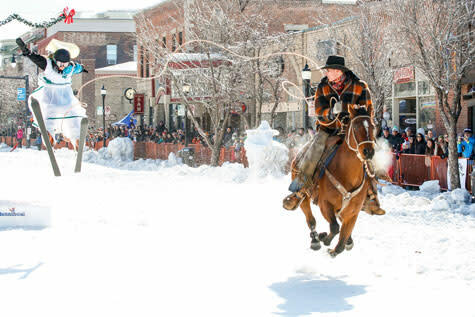 This celebration includes a variety of events that embrace Steamboat&apos;s western heritage and highlight our tradition of winter sports. 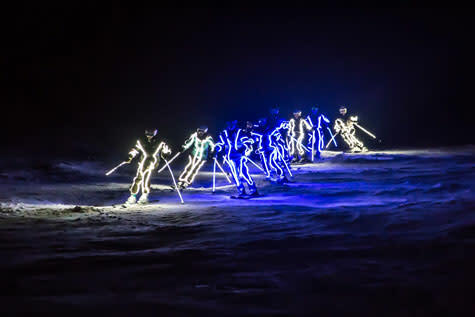 This unique event includes everything from kids pulled on skis behind horses down a snow-covered main street, to the Lighted Man at the Night Show Extravaganza who&apos;s battery-powered suit weighs 70 pounds. See below for more details on the street events and full event schedule for Winter Carnival. Registration for the 2020 Street Events will take place online, and will open next year in January. Winter Carnival buttons are for purchase at the following local businesses: Steamboat Springs Winter Sports Club - Howelsen Hill Lodge, Yampa Valley Bank, City Offices, Steamboat Springs Chamber, Steamboat Art Museum, Info Center at Steamboat Resort, UCHealth Yampa Valley Medical Center, Resort Group, Sotheby&apos;s International Realty, Wyndham Vacation, and Olsen Development. Please note that buttons can only be purchased with cash or check. Buttons purchased by credit card must be purchased at the Winter Sports Club office. Show your support of the Winter Carnival and the Steamboat Springs Winter Sports Club by making your purchase. Peruse our suggested itinerary for ideas on how to plan your Winter Carnival vacation with your family and friends. Let us guide you through the Winter Carnival event schedule, as well as experiencing all the winter activities Steamboat has to enjoy! 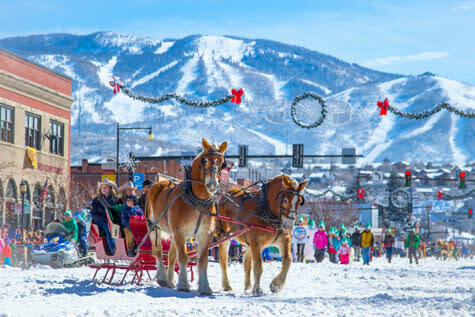 View our Winter Carnival video playlist below for an inside look at the amazing events that take place during the carnival, including an interview with Leif Howelsen, son of Carl Howelsen (founder of the Steamboat Springs Winter Carnival), that shows us the history and tradition behind this wonderful event. 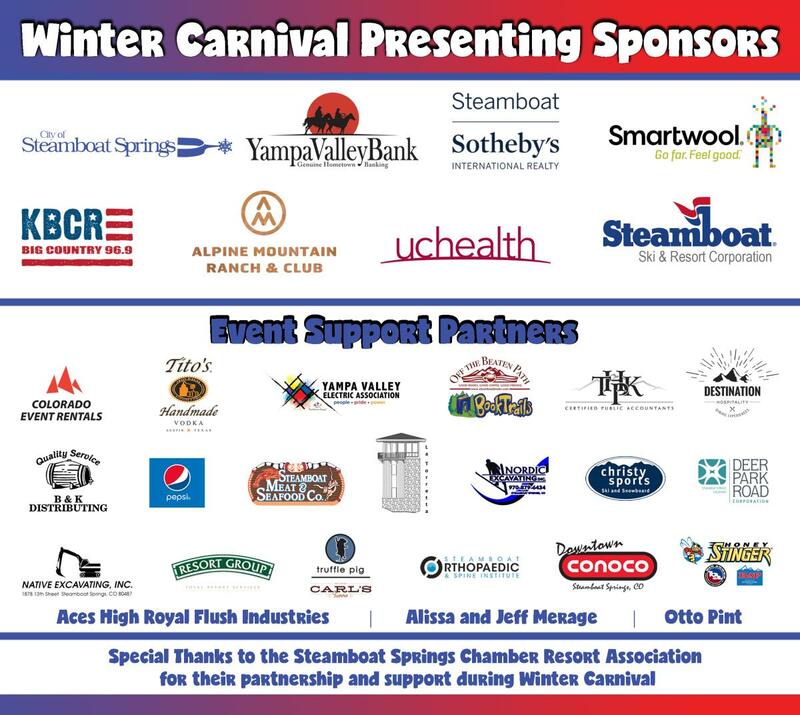 Find information for options on how you or your business can be a part of this unique and traditional Steamboat winter event. For more on volunteering, please contact Sarah Konopka, 970-875-7009. With the aim of maximizing benefits for sponsorships and streamlining the process for event partners, the Chamber believes that combining sponsorship for both the Winter Carnival Night Extravaganza and Street Events will provide our members and the local business community with increased visibility, and a more streamlined process to become a sponsor of Winter Carnival. 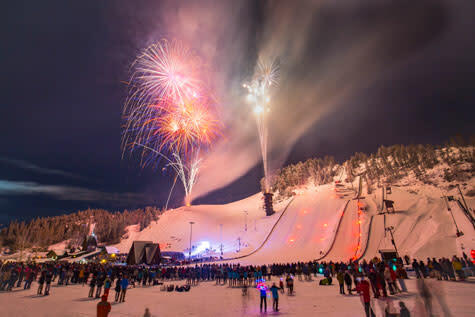 Our events team will partner with the Steamboat Springs Winter Sports Club and will continue to produce the classic downtown Street Events on Saturday and Sunday, while the SSWSC will take the reins of managing sponsorship for the entire 2018 Winter Carnival. For more sponsorship information please contact Ellen Campbell, Director of Development for the SSWSC at (970) 879-0695, ext. 115 or ecampbell@sswsc.org.